There was rapturous applause in Pairc Uí Chaoímh when singer Ed Sheeran arrived on stage in a Cork GAA jersey. The Suffolk-raised star kicked off the first of his sell-out nine-concert Irish tour in the Rebel county on Friday night. Ed Sheeran pictured performing at Pairc ui Chaoimh during his Irish Tour 2018. Photo: Daragh Mc Sweeney/Provision. He then launched into Castle On The Hill with the 40,000 Sheeran fans or ‘Sheerios’ singing along. “Irish audiences are the finest in the world,” he said before egging the crowd on and encouraging them to scream louder. 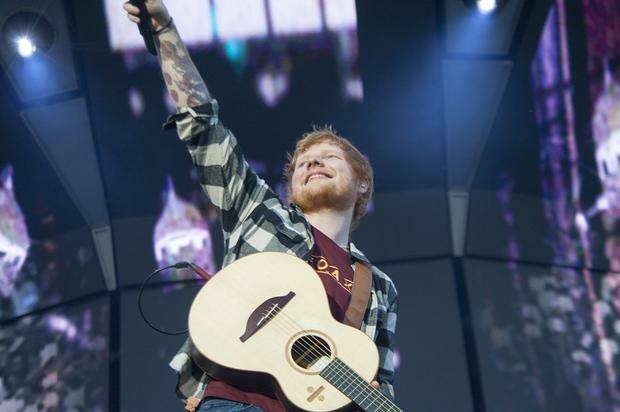 Sheeran’s concert marks the first concert in the sports ground since its €70m refurbishment. And he’s achieved something Prince, Michael Jackson and even Bruce Springsteen couldn’t – selling out three successive concerts at Cork GAA headquarters. Fans arrived at the stadium early in the day; Elena Smyth travelled to Cork from Clontarf with her Ed Sheeran-devoted daughters April and Emily. “We couldn’t wait for the concerts – it is absolutely fantastic,” they admitted. The three concerts are expected to generate a €60m boost for Cork – with the nine concerts in total expected to generate an economic fillip of €200m for the four city venues. The singer invited Beoga on stage to perform Galway Girl and Nancy Mulligan. The city revelled in a festive atmosphere in the build up to the concert - Idaho Cafe were selling ginger ice-cream and customers with red hair enjoyed a discount in many city pubs. What a fantastic first concert in the new stadium!